yes skymiles i totally agree with you. the interview was good. dima's english is really good. good luck to dima in eurovision. i hope he will actually go there. That was a really good video, Borislav!! That's such a nice message. It is great to hear from Dima again. I understand that he is working hard and I am waiting with patience for new surprises. I wanted to comment about the new song "padal sneg". It's pleasant to hear this type of song in these cold days. It seems that the music is more positive than the words, but still came out unusual. That recording of Ангел мечты by K/G/B is really interesting. Gurkova is pretty good and Barsukov is okay... but the song just sounds better as a solo... I know that K/G/B also did Несерьёзно together. I wonder how many other Koldun classics they've performed/recorded. wow i love dima's new song out of the blue!!! Where Jacqueline is from? From Russia or...? What Jacqueline is from? From Russia or...? And I too!The preview of the song it's amazing!The song is so powerful and I really can't for the official premier of the song! I love it sooo much!!! The new song with Jacqueline is very good. Is it really planned for Eurovision? That sounds drastically interesting! Can't wait to see the show. Is it really planned for Eurovision? Really? Dima will go this year in the ESC? or I understood wrong..? Woohoo!! I can't wait to hear the whole song! Right now I'm thinking that they both sound really good (Dima's voice... ahhhhh *swoon*) but their voices don't quite blend well together. Oh well, we'll have to wait for the finished version. And is it true that they're entering this for Eurovision??? It will be very cool,if that song is for Eurovizion,but Dima has the last word. Heyaaa can someone ask on the Russian forum if anyone has a video of the parts of Новогодняя ночь на первом with Dima not singing? Like where http://s55.radikal.ru/i148/1012/dd/957e91e57d13.jpg (ooh magic!) comes from? I don't want to go there myself, but I really want to see the rest! I like performance “New Year Night on Channel One” and Dima`s song “Snow Was Falling” . The song "The train" I listen with pleasure! I will wait for new performances now. And now about a duet with Jacqueline. It`s something unusual... In a word, a fantastic song!!! Mee,too.Every day i listen ''Falling snow'' and a duet with Jackline. ''Falling snow'' becomes even more pleasant after listening to it more and more. I still did not hear the complete version of the song with Jacqueline, and therefore cannot comment much, but partially it sounds good. I am not sure if Dima will go to Eurovision in a duet. I think that there will be another song for Eurovision if he will decide to go. I also wanted to pay attention at the performance from the "Song of the Year". I think if there will be an English text for this song, then it will nicely go for Eurovision. Everything looks pretty nice with the piano. It's so great to hear Out of the Blue finalized at last! (Yes, I WAS the first person to post it on this forum. Amazon rocks.) I'm amazed - yet another song that Dima gets SPOT ON. And Jacqueline sounded great too, and I did get used to the blend of their voices. The preview grew on me, so I was completely ready for the arrangement, the blend, etcetera, and then Dima just blew me away... aaaagain. The only problem with this song is that I don't think they sing enough. There's too much instrumental and not enough vocal. MORE DIMA! MORE! MORE! MORE!!!! I'm also part of the huge list of fans that love"Out of the Blue" .I really like the song and like I can see on the forum and on the other sites and forums the comments about the song are very positive!I want to say that I'm really impressed of the song because I'm big fan of the powerful and fast song and "Out of the Blue" is one of them.I really like the music and the lyrics and also Dima's voice.Dima's english is perfect so I think that he is totally ready for international carrier. I really like to listen Dima when he sings on english and I wish more new song on english.Like yesterday and today I can't stop listening the song. I can't wait to hear Dima 's solo version of the song.I hope that soon we will have a chance to hear it.Also I really like the text that is writen on the official site for the premier of the song.Big thanks to the writer of the text and to Dima,Jacqueline and of course the composer for the song! It's so cool that the video clip will be shoot in Netherlands so I hope that soon we will have more news about the video clip and many pictures and videos from Dima 's trip in Netherlands. At the end I want to wish a lot of success to the song and let this song be only begining for Dima's international carrier which he really deserves! I like very much a song "Out of the blue" !!! And Dime with Jacqueline for sining!!! PS I Will wait a clip on this song!!! Wow. This is cool. The song is pretty good. Can't wait to see the video. I hope Dima takes it to Eurovision. “She” is such a great song. The music is very beautiful, and the words makes it even more piercing into the mind. After listening a complete version of "Out of the blue", I can say that this is definitely a good song. I like the combination of voices in a different pitch, and that makes it very original. I didn't really get a good listen to Она, because the video quality was kind of iffy and I wanted to wait until it was recorded, but what I remember hearing was very good. I'm really looking forward to hearing the studio version, and also this new "Navigator" song. Keep up the good work! I absolutely love this new song "Out Of The Blue." It's great to have a new song in English and will boost Dima's international career into Europe. I can't wait to see the live performance and video clip!! Mee,too.I am sure,that the video will be great,i can't stop listening this song,IT'S AMAZING!!!!!!! I believe that this is a good, well-done TV program of sensible format. Anyway, I was pleased to have participated in this project, especially that I had sparring with Glyzin))) Hopefully you will like the TV version))). Pity that the questions were mostly around politics… And by the way, thanks for your support! I just wanted to add some comments about the video from the photo session. It seems very interesting to see Dima in a diferent way. It would be even more unusual if he will decide to perform in this type of clothes. I found that some snow plus sun created a fresh mood, even though some people were sleepy at this time like me. That is a refreshing beginning of spring. How do you guys like the performance with the little girl? It seems very cool! I think that Dima is performing with kids this year. That seems very nice, and it also gives an opportunity to these kids to perform with him. I think the webconference went really well... for not being able to understand it. He did answer my question, and he also answered somehting I've really wanted to find out, which was about his religious beliefs (except I didn't understand that very well either). If someone could post a transcription of the entire conference that would be fantastic, but I doubt anyone has the time. Also, Borislav, it seems you got major recognition. I forgot to watch the conference so if anybody has a transcript that would be great! I would really like a transcript as well. A video recording would be even better. Can I find one anywhere? I just ask Antis and she said to me that the video of the online conference will be soon!Probably in Monday! ))I will also inform the other international fans about this! btw was conference in english too since Jacqueline was with him or was it in russian? geez I'm totally lost with settings here on this new forum...anyone care to help how do you edit your post here? I am coming to conclusion that one way or another the process of creation is not getting any easier… Rather the other way round… I used to think that maybe I will learn and will be getting luck. Not likely! Every day, well, almost every day I come across some new problems and get childishly surprised with things that seem to be obvious… Like those… For example, with TopHit and the number of rotations. And even when the soundtrack is marked crimson in the broadcast calendar – it will make no sense… Without support of radio stations of the Moscow region who have their own rules and regulations. Now we have two or three soundtracks and we are trying to select from them a song that will follow. Every now and then there appears desire to look for a song elsewhere, and this contest on the website is just a trifle, we are being sent new songs in many ways, and my meeting with Kobylyansky was not just to eat meatballs… As well as my meetings with others, who are similarly well-known. Searching. However, let me congratulate you with May Day and happy trails in your life! The conference was definitely great. I was able to hear a lot of philosophical answers and interesting jokes. Thanks to Dima for that. I am also glad that we were able to see him again answering our questions. Can someone translate the video which Dima is giving some money inside a bottle?? What is that for?.. I really like Корабли! I was beginning to think - after Ночной пилот, Она, and Ничего - that Dima was getting a little bit attached to one sound, so it was great to hear a more upbeat song. And also, YAY, HE'S SINGING LIVE AGAIN!!! "Dear members and guests of the Forum! From the bottom of my heart I congratulate you with the New Year of 2012! Thank you for your votes and the time you spend on my music, discussion, critics and support of my songs. I am very grateful for everything! Let the new year be successful for you and me!))). The year was difficult, and I hope the next one will not be any easier, but the more pleasant is the feeling of the goal attained in one’s hands! I hope for your further support, THANK you that you are around!))) A Happy New Year!))) Hurrrrrray!" I really like the video сlip for Корабли. The surroundings are very beautiful and Dima's mood fits them well. 1. Не с той - FINALLY!!! I'm sure this song has been haunting every Koldunya since the Korolyov concert in 2009. Now we are at last going to have it for real! 2. Маяк - After watching the performance video of this song I completely fell in love with it. I really want to hear the "official" version now. 3. Дыхание - Just because it sounds a little bit different from Dima's normal stuff (if there is such a thing). It also seems like it would be coverable. First, I want to thank Dima for спасибоing my last post. I'm honored that my opinion means that much. So, Takeoff Day (as I'm now calling it) didn't work out so well for me, because there's no way as of yet to hear the album unless you go out and buy it in a store, and I can't exactly do that. When I finally get to hear the songs in full - I'm calling that Landing Day - I will put up opinions on them in this topic. May I suggest maybe putting Ночной пилот on a site like iTunes or Amazon? I'm totally willing to buy it twice... especially with all the iTunes credit I have. I do still want a physical copy but darn it I want the songs! Also, when I do review the album, if someone could translate what I post in a message to me that would be great. So I liked Почувствуй меня. It was fun and upbeat and a change from Dima's normal style. But I STILL haven't heard to Ночной пилот!!!! If you want to put it on iTunes, I'm more than willing to buy it twice. If you don't, then PLEASE PLEASE PLEASE put all the tracks up on the site! You did that for Колдун, so why not for this one too? Success! I've now entered what I'm going to call "cruising period" - that is, when I'm able to hear all the songs on Ночной пилот (in bad quality) but don't own the album yet. Someone uploaded the songs onto Fresh Records, and even though I downloaded them, this is NOT a permanent subsitute for getting the music the right way. I won't be satisfied until I have the album in my hands, but I am now able to do that review that I promised for every song... so let's get started! Ночной пилот: The first time I heard this song, the saxophone part seemed a little weird - like elevator music - but I've gotten used to it by now. I'm obviously fond of this song, since I even made a music video for my cover of it. I agree with Dima that it's pretty different from a lot of the music in the pop world today, and it's refreshing in a way. В комнате пустой: I was wondering which mix of this song was going to be on the album, since there are at least two different mixes with subtle differences. I personally like the one they chose, which has those few guitar notes during the second verse (unlike the first version that was released on the site). My favorite part of this song is the chorus at the end. Корабли: I remember when this song was released, and it was a more upbeat song after a string of ballads - sort of a return to Dima's earlier style (which makes sense because he wrote this one). Even though that's not as much the case here, it's hard for me to get rid of that impression. It's a great song. Не с той: This song has changed a lot from its first performance from the live set in Korolyov. For the most part I prefer the album version, but I do miss the beginning/ending ostenato and the original keyboard solo. I like the addition of the oriental instruments and the gong (I know that's Dima's favorite part). Я люблю: I was expecting something a little different at the beginning, given what Dima played in the preview video, but I like what I heard. There's that little "oh" during the chorus that I'm not too fond of. I have to say that Anton's solo is one of my favorite parts of this song, and I think that maybe taking the arrangement of instruments from under the solo and putting it into the chorus would have made the song even better. Под дождём: I have a feeling this song could be really great with a different arrangement. As it is, it's okay, but some elements seem out of place - for example, the funk rhythm doesn't agree with the slightly oldies-sounding chord progression. I like the verses more than the chorus. Ничего: I can't help but see the opening credits of 20 лет без любви! There's not much I can say about this song. It's a good one, let's leave it at that. Звезда radio edit: I always enjoy listening to this song, especially since I've recently been re-watching clips from the rock opera. I really can't tell which version of the song I like more (this one or the one on Колдун). I think I like the vocals on this version more though. Дыхание: Wow, I just noticed that this is the only non-bonus song on the album in a major key! It's a lot more pop-sounding than any of the others, but I don't mind. I could do without the backing vocals though. This is still the song that I want to cover. Ray of Light: Party time! I really enjoy listening to this song - so much that I always find myself dancing in my seat. Also, Dima's accent is a lot less noticeable here than in any of the other songs in English. Падал снег: I remember when this song first came out and my town had just had an ice storm, so the feeling of the song was enhanced by where I listened to it. It really is beautiful. It also reminds me somewhat of my own songs. В комнате пустой remix: I was surprised at how well this song responds to remixing. This remix is okay, but I wish they had used the other one (the Ugrumov remix) - it changed the chords in a way that better suited an upbeat song. Ночной пилот remix: This song doesn't remix quite as well, especially with the saxophone. I do like the echo effect at the end. That was cool. Overall impressions: Great album. Lots of good songs. I would have preferred more songs written by Dima, because they're usually the ones I like more. I can't wait to get my own copy! They're on Вконтакте now, in better quality. You can listen http://vk.com/audio?id=-10895265. I don't think you need to be part of the group. Like I said, it's far from the best quality. I've found it also (but in another web)- and in better quality. I'll try to post my notes later. But from the first listening I have to admit it's great. Even though totally diffrent from the first album.. Thanks to Donna for sending me the CD! Did anybody see Dima on Euro? It was so awesome that he was announcing the votes. I was happy to see him there. I did! I was so happy when I saw him, he was so handsome! I had so many years to see him on my tv again..
Dima did a great job announcing the votes - very professional! It was great to see him doing something for Eurovision! I wish he had worn the black shirt, but... oh well. Guys! I can tell that everyone noticed the change in the style of a shirt during Eurovision. This is interesting. I also believe that it was not his choice to wear that shirt. Dima still looked great as always. So, how do you like Dima's new clip 'Облака-бродяги'? Облака-бродяги almost literally made me cry. It's a beautiful song with a beautiful video. I understood the story of the video perfectly and it actually fit the song. The cinematography was brilliant. And of course I love the song - it's great and very moving. Sooooo... Have you already heard Dima's new song "Don't be sad" (Ne grusti)? What do you think about it? As for me I do like it! It seems to me so... I even can't explain... so much positive I named it "a small piece of happiness"
If you haven't heard the song yet you can find it in the "Аудио/видео" in Media. The song was taken from the Russin radio of Belarus that's why it lacks some words in the beginning. What's that? Dima has a new song out? DROP EVERYTHING AND BASK IN THE GLORY!!! Okay, Не грусти rocks! It's completely different from almost everything on his latest album - it seems like 2009 Dima is back this time! The very first thing that struck me was the retro-sound, kind of reminding me of the Beatles with the guitar setting. The vocal is, of course, fabulous - no surprises there. I'm particularly fond of the wordless backing vocals in the chorus. Who wrote this one? I don't understand all of the lyrics, but big kudos for giving a happy contrast to the melancholy tone of the last few songs/album. Edit: Dima wrote the words? See, you're not limited to writing sad songs, this is great!!! I've promised you to translate Не грусти. You will not be able to wait for a call. The rain on the eyelashes. Minutes have been frozen. And evrything will be OK again. Hide from everyone in the rain. Will stay in your heart forever. But you don't give up, fly! Thank you for the translation, Alena! OH MY GOSH. Graphics. Pyrotechnics. New keyboardist. Epic Pasha solo. Drumstick toss. New triangle-K branded guitar. http://mimishka007.livejournal.com/87434.html. Absolutely flawless vocals from Dima. НЕ С ТОЙ MADE ME CRY. Was there anything not amazing about the Mir concert?! It looks like it was pro-shot too. Any idea when we'll get high quality footage? As you can see in November there will be a new album of Dmitry Koldun - The city of big lights. 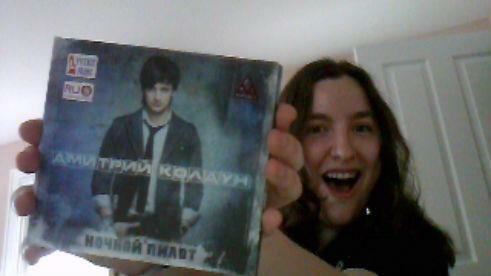 If someone want to buy this album you can turn to our http://koldun.name/forum/index.php?showuser=116. She is ready to help you. She'll order the album at one Russian website, where it is possible to send it anywhere. You have to write her your name, surname and the exact postal address. If there is some people of the same country you'd better cooperare 'cause postage is quite expensive. And one more thing. We need to wait until the album appears on that website and only after that it will be clear that it is possible to send it. I hope it happens in the last days of this month, with the official release of the album. Hey Koldunyas! I've put my order in with Donna for my lovely physical copy of Город больших огней, but while I'm waiting, I did manage to find all the songs online (AS A PLACEHOLDER) so here's a review! Город больших огней: I feel like I've landed in a classic movie... This is my first clue that Dima's mixing the sound of his latest album with the sound of his first one. I like it. It has the driving rock beat of Колдун with the romance of Ночной пилот. The song itself seems like a spiritual successor to Корабли. Облака-бродяги: Of course I've heard this one before, and I can't help remembering the first previews on Dima's Twitter vlogs when he would turn the music off right before the chorus. It's a beautiful song. I especially like the bridge with "огонь в моих гла-ЗАААААААХ" and the shimmery soft chorus right after it. And can I remind myself that the music video made me cry? Останься: Now THAT is a magical combination of guitar and synth! It's dreamy... and then the beat starts and we have the "album-mix" sound once again. LOVE the harmonies! This might get a spot as one of my favorites on the album. С дождями: It started like a generic pop ballad... but this is Dima, and Dima doesn't do generic pop. I'm liking the extra harmonies and drum effects during the verses. The soft chorus is REALLY cool, with a different vocal on both octaves. Is that Anna doing the "ah"s at the end? That melody is going to haunt me, I know it. Не грусти: ....ииииииии напрасно, ту ду аа оуу! http://koldun.name/forum/index.php?showtopic=25&view=findpost&p=25557. It never fails to make me smile. Не впоминай о ней: That beginning was unexpected! This also reminds me of Корабли, especially with the piano countermelodies. Another great bridge-chorus. And I love the ending with the guitar echoing. It kind of sounds like the struggle to "not remember her" is going to be endless. Не так: This one reminds me of Не грусти. It has the same sort of Beatles-esque guitar sound. And it also reminds me of a classic movie, like Город больших огней did. What is that voice saying in the background????? Сердцем: It doesn't sound very much like Dima, which makes sense because Katya wrote this one, so it probably sounds like her other songs (which I haven't heard). I'm definitely dancing in my chair. Their voices sound good together. Она: I was expecting Она останется одна, but instead I'm getting reminded a lot of Дыхание from the last album. It's really different from any of the other songs, and Anton's style almost reminds me of my own. Again, I love the combination of guitar and synth. A nice contrast to the rest of the album and a great way to end it. I absolutely love Dima's new album. It sound so fresh and easy. Each song has its own spirit and that's good. I even can't tell which song I like the best 'cause it varies every single day. Облака-бродяги is such a beautiful balad, videoclip too. When you're feeling low, Не грусти is the best cure. I'm always smiling while hearing this song. Не так has beautiful music on the other hand very sad lyrics... Вверх is very catchy, I like it very much. The song Сердцем with Катя Гордон was a great deal. It sounds little bit different but very nice. ...I could continue on and on but I think you already know I'm really impressed by the new album. I like it much more than the previous one, Ночной пилот. I like it from the first time; it took me some time to get along with Ночной пилот. Kind of like Город больших огней, the harmonies and the production remind me of the few old Soviet films I've seen. I personally like Dima's other styles more but this is great too. Flawless vocal as always. I like how the melody shows off Dima's range. The video looks cool, though I would have preferred a few shots of Dima singing. FINALLY! Since I have no way of getting the album in the USA if someone doesn't send it to me, I've had no choice but to get it off a sharesite, and that took a lot longer than I wanted. As always, this is just a placeholder and not a substitute for getting it legally, but it means I can listen to the songs, so let's go! Почему: Somehow I don't remember ever hearing this song in as high quality as here. I like the sound - like I said before, it reminds me of old Soviet films, with the slightly forlorn quality and the strings in the background. Манекен: And here's the pop-rock Dima I used to know! I expected something a bit different in the chorus, but I really like what I hear. The buildup before each chorus is especially satisfying, and the voice-over in the bridge... whisper to me forever. Я буду любить тебя: I feel like this is in the same style as Корабли. It's got the romantic feel at the start, and then the guitars kick in for a rock feel in the chorus. I don't make very many comments on lyrics, but these stand out with some great parallel lines - "кто бы знал, кто бы знал, кто бы знал..." Really well done. Медленно: Wow, this takes me back to the days of Я буду ждать and Прости за всё. It's awesome to hear a power ballad like this from Dima after so long. From the soft start to that amazing high note climax, this is one of those songs that I can only describe as "epic". Время нам разойтись: Another different style! I don't think I've ever heard Dima sing something in this kind of folky 3/4 that wasn't a cover since Царевна, and I think this song is even more beautiful. Мало тебя: This was my favorite of the three new songs Dima premiered a couple months ago. I love the pop-rock sound here and the melody, especially in the chorus, is really well written. I can't hear Dima as well as I'd like to, though. Метели: After such strong tracks, I have to say I can't get behind this song as much. Some of the chords and sounds don't feel right. But that's okay - I'm sure it will grow on me (I felt the same way about Под дождём). Скажи: Is it weird that I can hear influence from other Russian pop music in this song? It reminds me of some of the things that Dima was singing back in Fabrika. I also kind of like how it sounds somewhat like a musical theatre song - lots of range! Любовь-война: I think I have a new favorite song on this album in terms of songwriting. The melody is amazing and the harmonies are gorgeous. The production is powerful too and Dima's voice fits in perfectly. Холодные облака: This song definitely has the most drama. There's so much range, not just vocally but also in dynamics and production. It's a lot to take in. Поезд: One more style change before we end, hey? The guitar in this reminds me of Graham Coxon (anyone heard of him) and the driving beat is kind punk-rock-esque. I love how uplifting the sound of this song is. Overall thoughts: This is the most stylistic variety I've heard on a Dima album so far. So much fantastic music, and some real proof that our man can sing anything. Bravo. Just heard Поцелуй меня and currently listening to it on repeat. HELL YES I LOVE THIS SONG. It's got Dima's perfect mixture of rock and romantic, with the driving beat and the sort of Coldplay-esque synths in the background. The chorus hook is awesome, and need I say Dima sings it flawlessly?